Nest of 2 x 4 door lockers giving a total of 8 lockers! A practical solution to the problem of personal storage, for clothing, possessions or equipment. 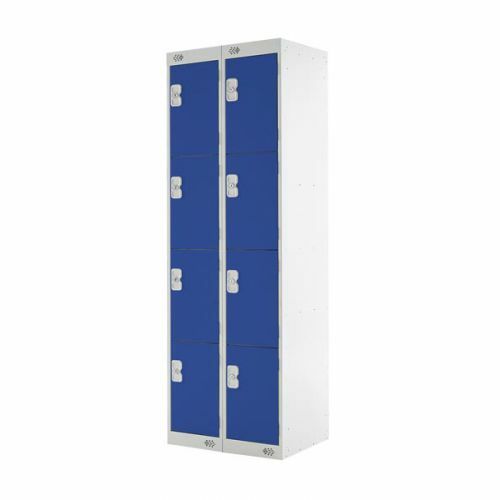 Versatile, hard-wearing and reliable, these lockers provide quality, choice and security as standard. Still retaining the basic need for secure storage, they also benefit from careful styling features, harmonised colour ways and a quality of finish, which is hard to beat. All lockers benefit from BioCote protection. This new coating technology inhibits the growth of potentially harmful bacteria and fungi, reducing the risk of cross-contamination from surfaces with high contact frequency. 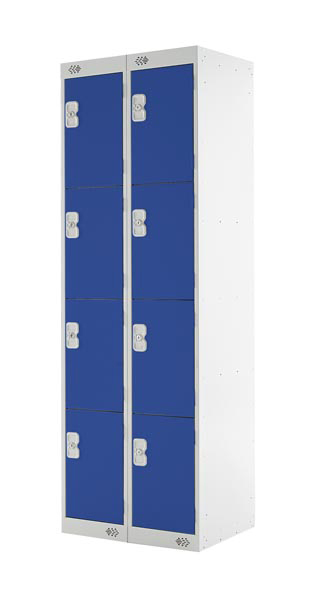 Each locker meets the testing requirements of the British Standard for Clothes Lockers BS 4680: 1996 Standard Duty. Nests of 2 or 3 lockers available in all number of lockers (1 door to six door). Please call for details.